"If we make it even easier for people to leave our products, we're forced to make our products better." 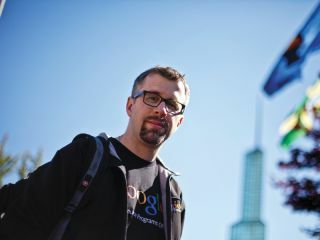 Having kickstarted the Data Liberation Front movement inside Google, and as an advisor on open source matters, Brian Fitzpatrick knows the inner workings of the search giant very well indeed. We caught up with him at OSCON in Portland, Oregon. Linux Format: How did the Data Liberation Front come about inside Google? Brian Fitzpatrick: It came from a number of things. I guess it first started when I graduated from college, and I couldn't take my email with me. And when I got to Google, I did open source stuff for a year and a half, or two years, and we were asking: "What else can we do in the Chicago office that's philosophically equivalent to open source, but not necessarily open source?" I talked to a lot of people, and we were told to always focus on the user. I thought, 'I'm not going to be the guy to make Google the next two billion dollars – but what can I do that's going to make a big difference?'. So I saw that we're getting to a point where big companies have a lot of data – where people are storing data in other companies. We don't need another kind of lock-in in the world, right? The way I saw it was, Google never locked users in for search. Why do you use search? Is it because you have a two-year contract? Did you buy a piece of hardware to use it? No! If you don't want to use it, you just use another search engine. Who gives a damn? The way we keep you as users is to make it better. Rapid innovation, rapid iteration. So we thought, 'If we make it even easier for people to leave our products, we're going to be forced to iterate even more quickly, and make our products better'. Everybody benefits from that, right? Users benefit from it, and we benefit because we're competing really fairly. I mean, as an engineer, I'd much rather build a better product than build bigger walls around a product. BF: Well it is unusual, but the thing to remember is that, today, we're in an unusual world. Fifteen years ago, if I had told you, "In 2011 there's going to be a global distribution centre that costs almost nothing to send things on," what would you say? You'd be like, "Oh come on! Is it teleportation?" But here we are in 2011 with the internet. It's a game-changer – it has changed the game in so many ways. And this is another one. It's really easy for people to switch software, and it's really easy for people to try new software. And that's great – people who, in the past, have been very afraid of computers embrace them. They'll try new things really quickly. LXF: Was the Data Liberation Front scratching an itch within Google – like engineers wanting to move data around in their own projects? BF: Sure, as an engineer I don't want to waste my time schlepping bits from one place to another. If it's easier for you to take it out, it's easier for you to get it in. We want to go both ways on that. I think a lot of people misunderstand why we do it. I think they understand why we do open source – they say, "Oh, Google wants everyone to think they're nice and cuddly." But the fact of the matter is, it's good for our business. It keeps us competitive. If we start building bigger walls, and leave our products to lie fallow, what's going to happen? Some start-up who really wants our customers is going to come and build an amazing product. Any other competitor can do it, and they take our users away.